Hi I'm Paul & welcome. I'm a full time Hampshire wedding photographer, based in Fareham covering the South of England & beyond. My passion & life is everything photography, including wedding photography, family portrait photography & newborn photography. I shot my first wedding back in 2012 & haven't looked back since. I describe my style as natural & story telling; looking for genuine moments to happen & capturing them as a memory you can look back on & cherish forever. Please see my portfolio for examples of my style & approach to photography. 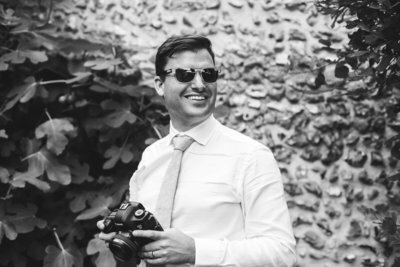 "Paul had a relaxed and informal approach, he made our guests feel comfortable and put us at ease resulting in the beautiful, natural photographs we were after! Paul was unobtrusive yet still managed to catch those perfect moments and all the finer details to enhance our memories of the day. We have a wonderful collection of both formal and candid shots which captured the happiness of our day perfectly. We were overwhelmed by the quality of the photographs; the clarity and colours beautifully depicted the fresh crisp day we had. We have received so many compliments, we would highly recommend Paul to anyone looking for a wedding photographer, he has given us memories to cherish forever!